Domestic Air-travel to Surat Thani followed by bus/ferry transfer to Koh Samui. Fare is the most expensive but obviously the fastest, ideal for the persons who have only a little time. The direct flights from Bangkok (Suvarnabhumi Airport) to Samui are by Bangkok Airways and 2 flights daily by Thai Airways. Or you can fly to Suratthani (Thai Airways or One To Go). From the airport there are minibuses which shuttle up to Donsak's port, the ferry boats place of departure. Take care of your baggage in Bangkok or you will arrive at Samui without any! Your baggage will not be redirected automatically at Bangkok Airport, so you have to pick it up, move to domestic terminal and check-in your baggage again. To avoid any confusion when arriving at Bangkok Int. Airport. After arriving at Surat Thani Airport (about 1 hour), you can take an air-conditioned bus to Koh Samui. Tickets are also available at Bangkok Airport. At Bangkok railway station (Hua Lamphong) you will find a color marked ticket counter on the left side of the counters. There you can buy the combined tickets. You can choose your mode of transportation - 1st or 2nd class, seat or sleeper (recommended) and Ac or fan. Price for a combined ticket is app. 800 Baht for 2nd class and app. 1200 Baht for 1st class. You also can buy just the train ticket if you prefer to go by ferry to Koh Samui. Buses to the 2 ferries (Raja Ferry and Seatran Ferry) are waiting in front of Surat Thani railway station. Tickets for the transfer and ferry are issued at the bus. Tickets for a night-train can be booked at Bangkok Airport, Bangkok Railway Station and many travel agencies in Bangkok. So, you have to use a taxi to go. This concerns all people, who like spend at least one night in Bangkok. It is not sure to get a ticket for the same day! The best information about these tickets you will get at the railway station in Bangkok. Travel time from Surat Thani railway station to Koh Samui is app. 2.5 hours. Tickets can be purchased at the railway station in Butterworth or at the ferry terminal in Georgetown (Penang). There is only one train per day leaving Butterworth at 14.10 p.m.
At the border you have to leave the train with your baggage. After the checkpoint you will travel further to Hat Yai with the same train. As you arrive at 11.00 p.m at Surat Thani you have to stay overnight and proceed with your journey the next morning. Just ask your hotel to arrange the transfer and ferry. 1st class 50kg, 2nd class 40kg, 3rd class 30kg. If you use the train, it stops at Surat Thani railway station. You then take a bus to Samui (combi-tickets available). The ferry transfer is included because the bus uses the ferry. A detailed time-table is below. On the island the bus first stops at the ferry pier and then at Nathon pier. They (almost) all travel by night. You leave Bangkok between 5.30 and 8 pm and journey lasts generally 10-12 hours until Suratthani, about 650 kilometres south of Bangkok. The VIP : "Very Important Person"
Very comfortable, 24 seats, briefly it is good, but is expensive. On the island the bus first stops at the ferry pier and then at Nathon Pier. Remember to tell the resort where and when you want to be picked up. (Surat Thani - Samui app. 3 hours, ferry included). The connection from Suratthani city. Not more than 2 hours, you will arrive directly at Nathon's port. A little more expensive than the other boats, but air-conditioning and practical. Dep. Dep. Dep. Dep. Dep. Dep. Dep. Dep. Arr. Dep. Arr. Dep. Dep. Dep. About 1 hour and a half to Koh Samui, can contain vehicles, small snack bar inside, full of seats and an "air-conditioning" cabin. - Raja Ferry departure from Donsak Pier arrival at Lipanoi pier. Starts at Bandon pier in Surat Thani at app. 2300h. 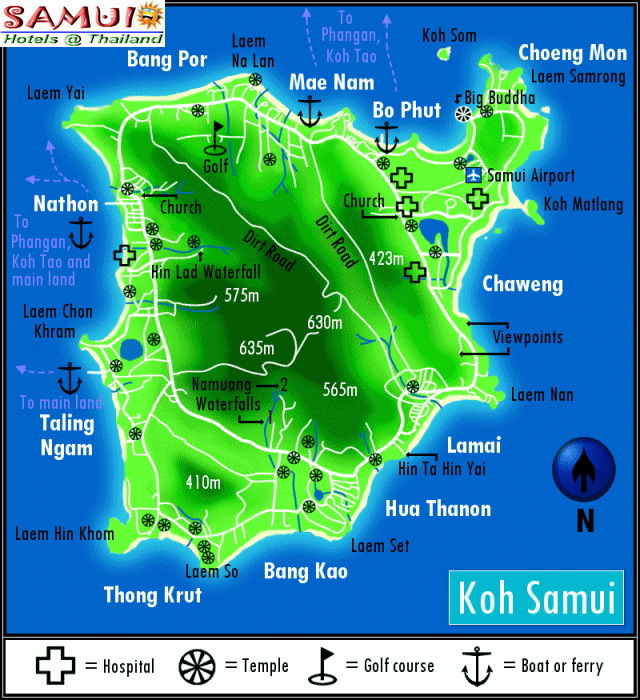 Arrives at Koh Samui at 0530h. The boat has 2 decks and you will be provided with a mattress and a pillow. Expensive but very fast (Koh Tao-Koh Phan-Ngan = 45 minutes, normal boat = 2 hours). Used a lot from Koh Tao or by various daytrips tours and some diving schools.